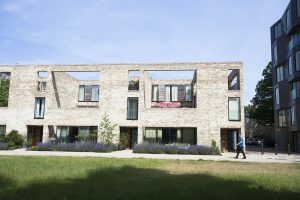 In the morning we visited the Stirling Prize winning Accordia housing scheme, followed by a visit to Cambridge Architecture department in Scoope Terrace and the new extension by Mole Architects. We then popped into see John Outram’s Judge Institute, followed by visits to Downing and Pembroke College. The latter featuring buildings by Sir Christopher Wren and Eric Parry. It was also Robert Wilson’s old college, whilst studying for his diploma. 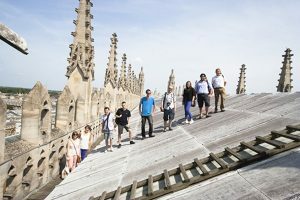 After lunch we had the privilege of a private tour of the roof space and roof itself of King’s College Chapel, thanks to Henry Freeland of Freeland Rees Roberts Architects, who has been involved in the conservation of the chapel for many years. 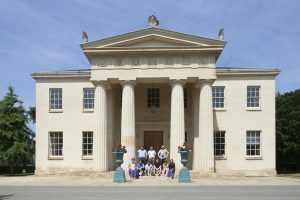 The architecture ended with a visit to the law faculty by Norman Foster and history faculty by the late James Stirling. 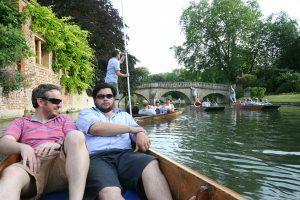 The day was concluded with punting on the River Cam, drinks in the Eagle pub and dinner.